It’s only 9.25 a.m. and already I’ve been reminded twice that simple things can make a big difference. The first relates to this video I watched earlier – ‘Make The Homeless Smile – Worldwide’. Such a simple gesture but so moving. I’m guessing the act of being acknowledged by a stranger is as much a gift as the clothes or food. The second example was an arty one. It’s a bit cooler today so I’m delighted to be in the attic. My intention had been to get to work on a painting to display the quote you voted for in my ‘Vote For A Quote’ game. (If you missed that one there’s a new poll running. Click on this Vote For A Quote link to state your preference). However, I’m not feeling particularly inspired right now so have been clearing up a bit and, whilst doing so, found myself covering an old ice cream tub. 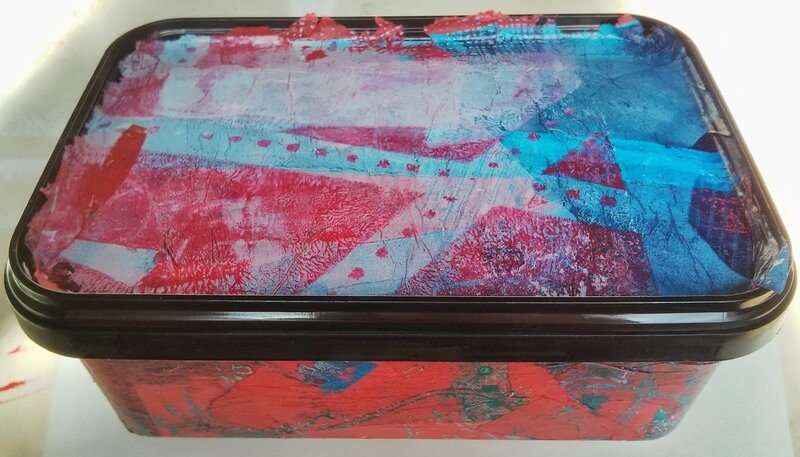 I used one of my Gelli prints I did on tissue and just stuck it on with PVA. Now I have a pleasing container for my mark making things. I had no intention of doing this when I started this morning but I’m really pleased with it. Much simpler than an “official” painting but just as pleasing. Maybe more so since it was unexpected.